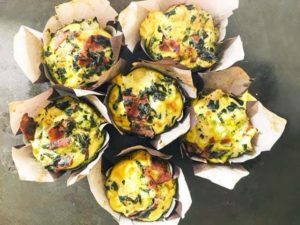 Make these Better Egg Bites for brunch or make them ahead to have a better breakfast, post-workout or midday snack available anytime (these refrigerate for 3-4 days). They are a great way to get in a rainbow more often. Get the Better Rainbow and Protein Evaluations. Use liners for 12-cup muffin tin (avoid ones with aluminum). Whisk yogurt, eggs & egg whites in a bowl. add a pinch of salt or Parmesan cheese to the bowl and try to fold salt or cheese into egg yogurt mixture. Combine veggies in a separate bowl. Fill each muffin tin 1/4-1/3 full with veggies and herbs of choice. 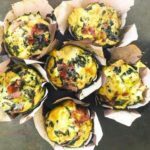 Fill each muffin to the top with egg mixture, pouring over the veggies already in each tin. Bake for 20-30 minutes or until risen and slightly golden on top. Let egg bites cool for a few minutes, then remove from tin.